In a seemingly unprecedented move, a group of Amish Christians from the US made widespread use of modern technology - including airplanes, tour buses and even iPhones - in order to come to Israel and apologize to the Jews. The Amish are most notable to outsiders for their shunning of the technological conveniences that have made life so fast-paced for everyone else. But they did not shy away from using whatever means necessary to accomplish what they viewed as the vitally important task of making things right between their community and Israel. 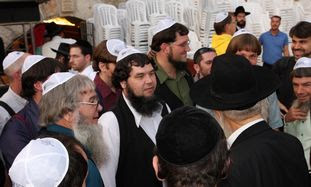 The Amish, both in the US and Europe, have a long history of anti-Semitism and have traditionally been firm proponents of Replacement Theology, which claims that God cast aside the Jews for their widespread rejection of Jesus as their messiah. Many Amish once believed the Nazi Holocaust was God’s punishment for that rejection of Jesus, and actually applauded Hitler. The document concludes by committing the Amish from this point forward to speak out strongly in support of the Jews and the Jewish state. During their stay in Jerusalem, the group made great efforts to interact with average Israelis, who needed little prodding to satisfy their curiosity regarding these odd-looking foreigners who had come with a message of such warmth and love.